Every so often some great worthy of literature will pop up and tell us all how important it is we support legacy publishing (and incidentally how evil Amazon is) then we come across tails of woe like this. I’ve off and on followed Girl Genius for about ten years. I in fact met this guy at Loncon in August 2014. In webcomic terms it is in the top division, with a very high quality artwork and an engaging story. To not be able to sell such a comic is fairly breathtaking. 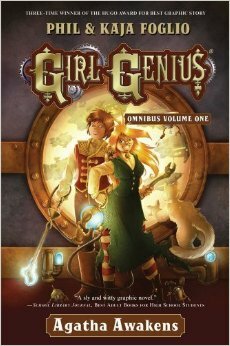 The creators of Girl Genius are in effect lost to old legacy and there’s a good chance anyone who read this blog is as well. Why should any creator jump through hoop to attract the interest of a publisher if manger in which the work is handled after contracts are signed is nothing more than a roll of the dice? Publishing doesn’t seem to have an answer or even be aware of the question. So… Mad Max: Fury Road. In broad terms I think there are two kinds of films: those that get better on further reflection and those that get worse. Fury Road is one that falls into the first category. At first glance it is THE FILM WITH NO PLOT, basically one long chase sequence with anything resembling character development sacrificed to yet another car explosion. However on reflection it is a film with a surprising number of layers. The first and probably the most noticeable is just how much agency the female characters have, in fact that rather understates it. Charlize Theron character’s – Imperator Furiosa – makes at least ninety percent of the running. The plan to rescue the five wives of the despot is her plan and by the time she meets Max she’s successfully pulled off the first stage of the plan. Max is virtually a supporting character; I have to wonder whether this film started life as a ‘Furiosa’ film with Mad Max only tacked on when a Hollywood suit realised they were in danger of making an original film and panicked. Even the secondary female roles make significant contributions as willing human shields that their attackers can’t simply shoot through. Considering in most of the films I watch the female characters are the trophy that is awarded to the hero at the conclusion, usually without an acknowledgement that even conceivably she could have an option on the matter. A strange thing to find in a film that appears to be this years biggest dumbest film. Another layer can be found in the form of Nicholas Hoult’s Warboy character, who gives us an examination of how individuals can be persuaded to sacrifice their own interests to a charismatic leader who controls through both means of production and religion. In more general terms the visuals are impressive with physical effects front and centre. CGI I presume was used for some shots only because I haven’t heard anything about Charlize Theron having her arm amputated. I saw it in 3D and I remain unconvinced it is worth the effort or the gimmicky shots that it seems to bring to a film. This isn’t an good film, its an okay film. Had they ditched the Mad Max character completely and spent the time on developing Imperator Furiosa, her history, her motivations and fleshing out the world she lives in, then perhaps it could have been good. While now long since superseded, the construction of the Defender class starships remains one of the greatest technological achievements of the 21st Century, if not all of human history. In less than a decade, mankind went from crude chemical powered rockets, scarcely able to reach high orbit, to jump capable starships. After the events of Monivea in 2022, the surviving members of the Aèllr crew tried hard to persuade their captors that the Confederacy was fundamentally peaceful; with the casualties inflicted on the Irish Defence Force, a tragic anomaly. While Earth’s political leadership desperately hoped for this to be the case, the majority opinion was that Earth simply couldn’t afford to risk another encounter while technologically so far behind. The lessons of human history showed that encounters between two cultures, where one was significantly more advanced than the other, had almost invariably proven disastrous for the less developed of the two. With further encounters between the Confederacy and Humanity likely to be a question of when rather than if, it was clear that the means needed to be found to meet the Aèllr on an equal footing. At the start of the Defender project, the designers were faced with an unparalleled challenge. The technology, the tactical role, indeed the very tools that would be used to build the ships were themselves all under development. To add to this already daunting task was a desperate urgency for results. A detailed examination of the Defender project design notes provides a virtually day by day record of human understanding of spacefaring technology. The very first sketches, dating from the start of the Long Calm period, indicated a vessel bearing a more than passing resemblance to the American Orion project of the nineteen sixties. This design was for a vessel launched from Earth’s surface via nuclear pulse propulsion. Early breakthroughs in regards to plasma engines allow for this and similar schemes to be mercifully abandoned. The success of the Starhaul lift system made the transportation of large loads into orbit a practical proposition and instead plans began to coalesce around the concept of a vessel constructed in orbit with no ability to land. The earliest tactical theories suggested the way forward might primarily be a missile ship, firing nuclear tipped projectiles. However while great strides had been made in reverse engineering the Aèllr fusion engines, the early attempts to miniaturize them sufficiently to use in missiles were abject failures. The drives produced so much radiation that any computer systems would be destroyed and there was even a risk of the radiation bombardment causing the fissionable material to go critical prematurely. This left only traditional chemical rockets, which would be slower and less manoeuvrable than their likely targets. It was judged, and in fact proved to be the case, that such missiles could only reasonably hope to hit, if the launch vessel was so close to the target that it would also be in danger from a nuclear warhead. In contrast the work on the recovered plasma cannons was progressing well. The exact nature of possible space combat was at this stage hotly debated within the newly formed CPDF – Combined Planetary Defence Force (renamed Battle Fleet and not to be confused with the much later Planetary Defence organisation). There were a number of schools of thought; the first believed that the best route forward would be the construction of a robust, semi-mobile vessel that would remain close to Earth. This line of reasoning would ultimately lead to the construction of the battleship Resilient (See Ships of the Fleet Volume One). The second and third groups, often collectively known as the Engage at the Heliopause groups, favoured a faster, more mobile platform, capable of meeting an incoming vessel further from Earth. Where these groups diverged was on the question of the exact nature of combat. One favoured what would become known as the frontal assault model, with opposing forces making a series of head-on high speed passes, with opposing ships exchanging fire on approach before reversing heading, decelerating to make further passes. The second believed it would take the form of ships moving parallel to one another and exchanging fire. While much time and ink were expended on the topic, the reality was that no one knew. It was only in 2025 that the governing council ruled that humanities first starships would be designed around the frontal assault paradigm. With this in mind, the dominant feature of the class was to become the armoured bow cap, which would absorb over ninety percent of the mass committed to armour. However this could not simply be a solid shell. While the early research indicated that a wormhole drive or as it would be come known, a jump drive, was within Earth’s reach, the first generation drives would not be the equal of the Aèllr example that inspired them. In particular the drive nodes needed to be well clear of the bulk of the ship. While the physics of jump drives was still poorly understood, it was clear than the drive had to be mounted in the bows and could not be behind armour. The designers were forced to develop an armoured cap that could open to allow the nodes to deploy. Two different systems were used, the first two ships used a large visor that slid down from the upper hull; in service this was found to be prone to jamming in the raised position, thereby limiting the arc of the upper turret. The remainder of the class therefore used an alternative arrangement that had two shutters. What little remained of the armour allowance was spread down the entire length of the ship. It should be noted this layer of armour was primarily anti-radiation and in combat offered negligible protection. The initial arrangements for the sub-light propulsion were to follow the model that was trialed on the test ship Fusionian. This would mean two single facing engines mounted on nacelles. The nacelle arrangement was proposed not to enhance manoeuvrability but because these engines produced large amounts of radiation (for the same reason the radiation screens were mounted inboard of the engines. However this was rejected by the military on two counts. The ship would only be able to decelerate by reversing its facing, thereby potentially turning the armour protection away from a threat. Secondly if one engine failed or was knocked out, the off centre thrust from the remainder would make the ship very difficult to handle. The nacelle engines became double facing, while a third single facing engine was added to the aft hull, although to keep radiation emissions acceptable, this engine had to be down-rated to provide no more than two thirds its possible thrust. The main armament of four mark one plasma cannons, were mounted in double partial turrets, one above and one below the hull. These mountings had a traverse of only twenty degrees left and right of the centre line, but with the expectation of only frontal combat, this was not considered a handicap. Additionally two internal forward facing missile tubes were mounted in the central hull. It is worth mentioning that at this stage, it was still hoped that peaceful contact with the Confederacy might be made. Therefore versions of the design were drawn up that would have seen the plasma cannon turrets replaced with either larger sensor arrays or shuttle bays. Even at this early stage there was an understanding that the sensor package needed to be more than just radar. Passive sensors would be more discrete and less subject to transmission lags and in an attempt to meet this requirement, four optical sensors were fitted in ball mounts, one on either side of each of the radar towers. Unfortunately in service, engine vibrations largely rendered these ineffective. 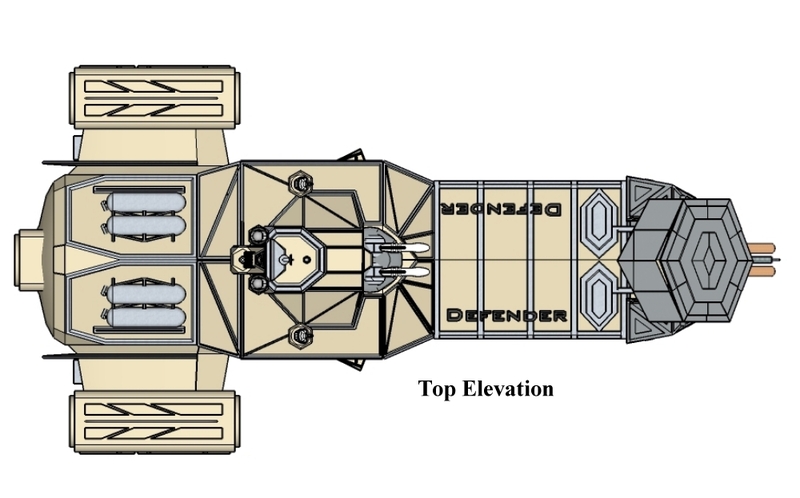 The layout of the ship can be broken down into three sections; the forward-most housed the jump drive, fuel tanks and crew quarters, mid-ship, command and weaponry, with engineering astern. It is important to note that the raised conning tower was not installed to give the ship commanders windows to look through. Among the data seized from the Aèllr ship was some extremely limited information of their fleet. These ships also had raised conning towers; this feature was left over from the reunification war of over a century earlier and a period when opposing ships were exclusively armed with mass drive weaponry. The rationale being that an attacker would likely aim for the centre of mass, so moving the bridge away from this and into the conning tower would improve survivability. With no firsthand experience of their own, Earths’ designers chose to follow suit. Inevitably with so much technology in development, not all of the designers’ estimates were to prove correct. In service the Mark One plasma cannons had far heavier requirements for coolants than even the worst-case estimates. With no redundant volume to work with, additional tanks had to be mounted on the outer hull. Although many claimed credit for the success of the Defender project, the greatest share must be given to the American engineer William Spencer, who guided the project through the difficult years of the Long Calm. There were many occasions when the project was in danger of collapsing, whether due to competing national pride or technological uncertainty. Spencer’s ability to both sooth politician concerns and willingness gamble that all of the necessary technologies would be ready in time, kept the project on track, although the stress undoubtedly contributed to his premature death. Only three weeks after the First Battle of Earth, President McCray became the first serving head of state ever to go into space. 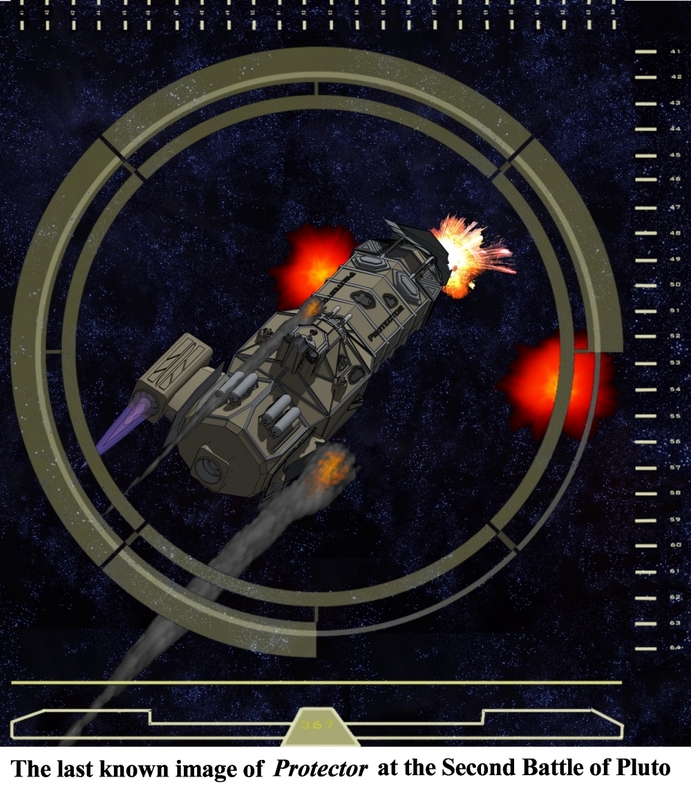 Launched with the words ‘to defend all mankind’ Defender became the Battle Fleet’s first true warship. For the first year of her existence Defender primarily served as a training ship, exercising intensively within Earth’s solar system. Operational plans for this period indicate that in the event of the arrival of a second Aèllr task force, Defender would have sought to engage close to Earth, where she could support ground launched fighters. By this time Defender’s core design was already falling out of favour as the fleet began to grasp the problems with the frontal pass attack pattern; the designs that would follow would instead favour broadside fire. However the Defenders were for now all the fleet had to work with. With the completion of Stalwart, the forth and final member of the class, the fleet was ready to attempt a more aggressive posture. It was accepted that combat inside Earth’s solar system would likely mean close to Earth. Orbital defences of the planet were at this time entirely absent, leaving the orbital dockyards hopelessly vulnerable. 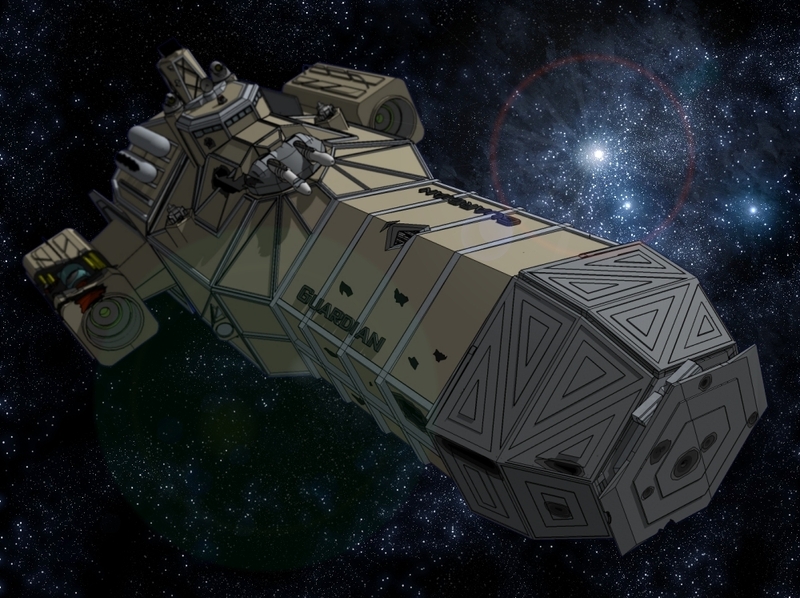 It was correctly believed that a second Aèllr task force would chose to pass through Bernard’s Star on-route to Earth. With this estimate in mind, it was decided to attempt to move the war as far from Earth as possible. The wisdom of this course of action remains hotly debated by historians, a debate which goes beyond the terms of this study, it was however a campaign which saw the Defenders operating at the ragged edge of their physical capabilities. The poor fuel efficiency of their laser focus reactors, combined with the heat build up from the primitive jump drive, meant than even a distance of less than six light years required multiple stops to refuel and vent heat. With no tankers yet in existence, the Defenders were forced to act as their own, establishing refuelling points in interstellar space. It is also worth noting that aside from when the ships were under thrust, the class had no simulated gravity, meaning crews were subject to both bone decalcification and muscle loss during these extended operations. By the end of the Bernard’s Star Campaign, the weaknesses of the class had been exposed and indeed it was fortunate none of the four received crippling damage where the fleet would have been unable to recover them. Even allowing for the heavily armoured bow shield, having to go bows on to the target to bring the main armament to bear, meant putting the jump drive directly into the line of fire. A single armour penetration was almost certain to cripple the jump drive. Even a non-penetrating strike proved all too likely to jam the movable parts of the shield, preventing the deployment of the drive nodes. But for the fact that the designers had equipped the ships with the ability to jettison the shutters, Stalwart would have been lost. The lightly armoured flanks also meant that even breaking off from an assault, left the ships vulnerable. When the war returned to Earth’s solar system, the Defenders were involved in frequent hit and run operations around the system. As the oldest and by now least valuable of the fleet’s starships, the Defenders were used to lead assaults and cover retreats and in the last year of the war, all four members of the class would see hard use. Given the intensity of combat in the last six months of the war, losses were inevitable and Second Pluto, saw the destruction of Protector and Stalwart, while Defender and Guardian were both severely battered as they broke the Aèllr line. Post-war, neither of the survivors was to have a meaningful career. 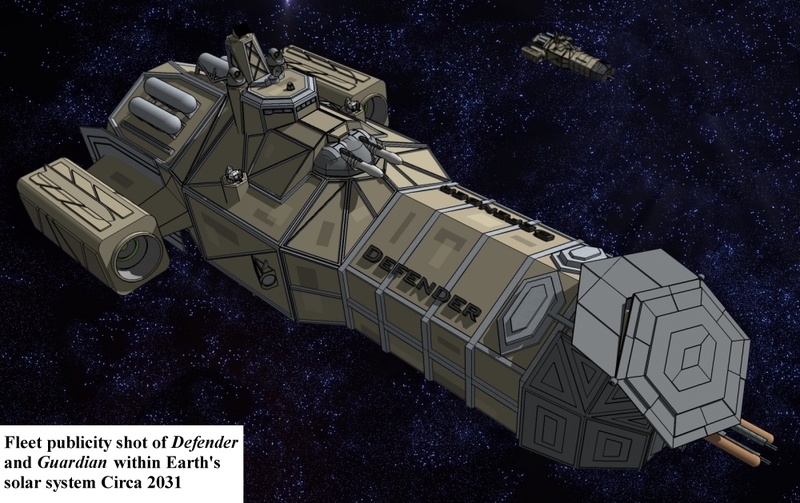 Badly damaged as well as being conceptually and technologically obsolete, Defender and Guardian were both decommissioned. Although some efforts were made to preserve them, this proved impractical. However, one turret from Defender was brought back to Earth, where it can now be seen at the Smithsonian Air and Space Museum. 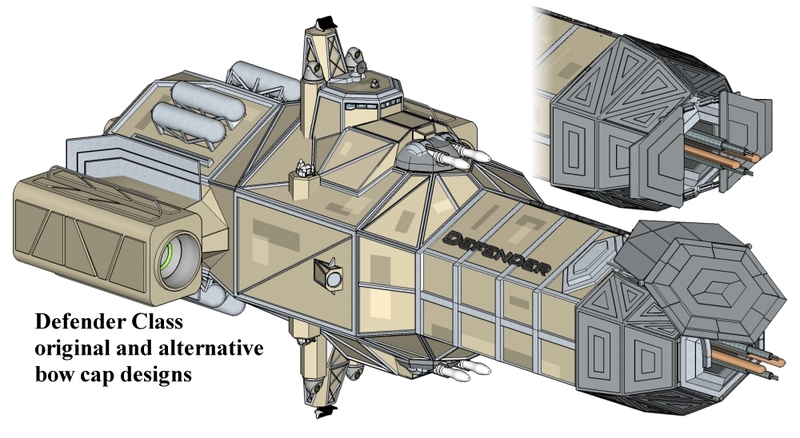 Aside from the small prototype Fusionia, Defender was the first human starship. Designed and built under incredible time pressures, that they were ready when so desperately needed must be rated as one of the great technological achievements of the 21st Century. Revelations from Aèllr sources indicate that even to this day, the Confederacy believes that such ships could not have being designed and built in the time frame humanity claims, high if unintended praise for the design and construction teams. That said the Defender class was far from flawless. Its main defects all come from a common source, namely the frontal assault principle. Quite simply, this was wrong and, with the partial exception of the raider Onslaught, has never again been repeated in any human cruiser. While directly approaching an opposing ship offered the smallest possible target, with the jump drive effectively at the centre of mass, any penetrating hit was likely to be crippling. In fleet actions, the negligible flank armour rendered the class highly vulnerable to cross fires, which in service resulted in heavy crew casualties. These mistakes can be laid firmly at the door of inexperience. With nothing beyond theory to guide them, the designers were forced to make do with simulations and guesswork. What is less easy to understand is the decision to power the ships with only a single reactor. It would appear from available documentation, that fitting the ships with two smaller reactors was rejected as the engineers sought to avoid the complications of merging two plasma feeds. This simplified the engineering burden but, combined with the largely unprotected engineering spaces, left the class fatally vulnerable to power loss. 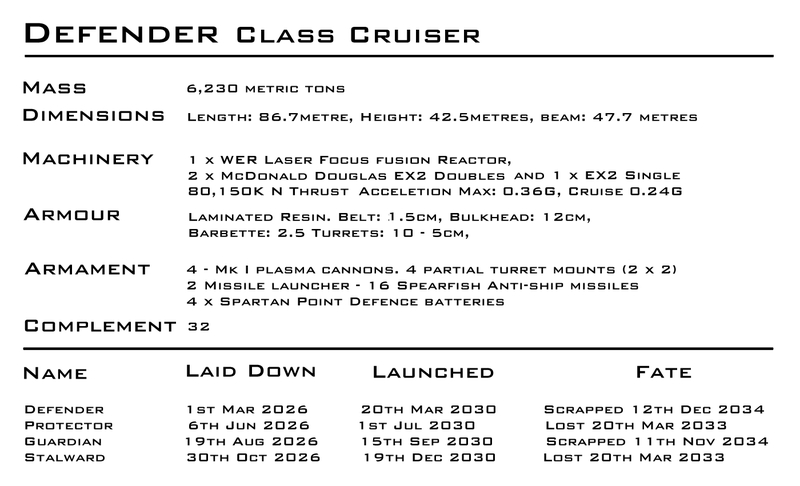 Some sources list the Defenders as system defence boats rather than true cruisers. Certainly, with their limited fuel bunkerage and inefficient power plants, operations away from a fixed base were extremely difficult, an early demonstration of the problem that would plague most of the wartime cruisers. Although flawed, and undoubtedly flattered by a battlefield performance enhanced by the failures of their opponents, there is no question that the Defenders were largely a success. Not only did their brave assaults succeed in blunting the Aèllr spearhead, but helped the nascent Battle Fleet establish a morale superiority over more the hesitant Aèllr Defence Fleet. So while they were crudely designed and hastily built, the Defender class lived up to their name. 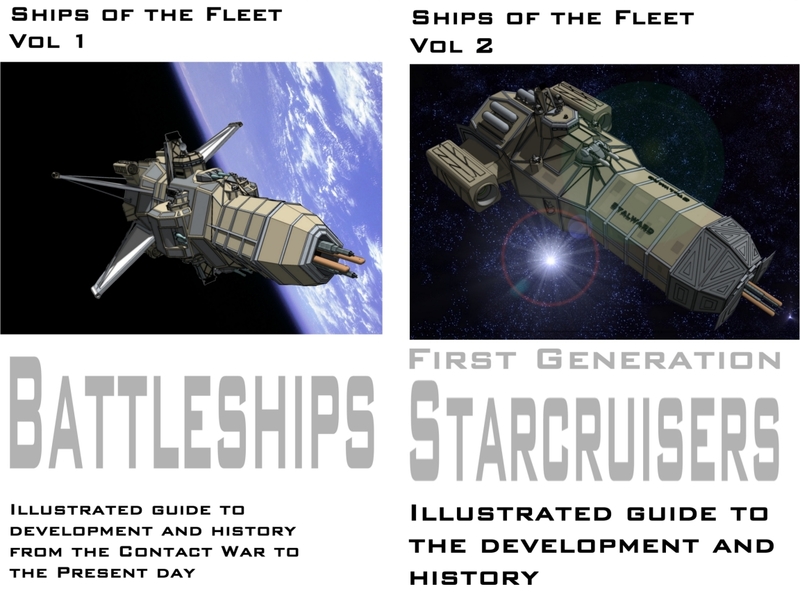 The Defender Class is part of Volume Two of Ship of the Fleet which is now available for pre-order at Amazon.UK and Amazon.COM, the release date is the 1st July. On the 15th June I’ll be putting up a second sample fleet and sending out a further sample to those on my mailing list.